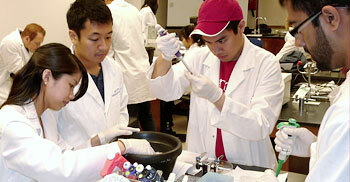 Welcome to the Biology and Biochemistry Department’s website for Laboratory Instruction. The laboratory courses we offer cover a wide range of disciplines and methodologies aimed at providing students with the knowledge and practical skills required for advanced studies and future careers in biotechnology, biomedicine, and academia. Applying a hands-on, team based approach for learning laboratory procedures and protocol, the fundamentals of scientific method, experimental design, hypothesis testing, and technical writing are taught throughout the laboratory curriculum. As students advance in their studies, they develop competencies in problem solving and critical thinking, and are exposed to biological and biochemical technologies comparable to those used in modern research laboratories. The Office of Laboratory Instruction located in 108 STL Building functions to coordinate activities and supervise the teaching of the laboratory classes. Lab instruction personnel strive to maintain high academic standards by revising curriculum, upgrading laboratory equipment periodically, implementing new teaching strategies, and incorporating the most recently developed technologies. Core personnel consist of four faculty laboratory coordinators who oversee specific laboratory course divisions. For assistance with a laboratory course, please contact the Coordinator of that division.